The Sandhills of Nebraska is an ecologically sensitive region that has been the subject of heated discussion due to the plans of TransCanda to build the Keystone XL pipeline across the area. While I am glad that an increased awareness of this area has finally come, it should have come sooner and in a more positive light instead of the crux of a international debate. 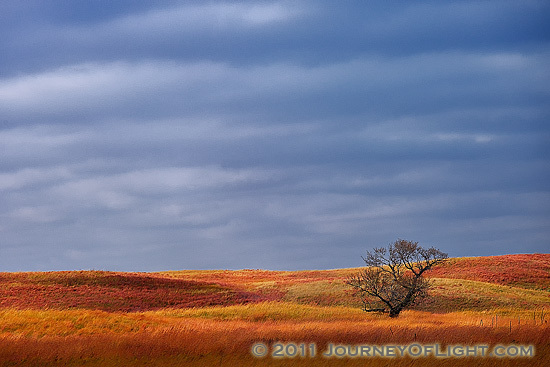 The Sandhills is an area that is both beautiful and subtle, undulating hills and prairie as far as the eye can see. This is not the stereotypical Nebraska of corn and agriculture, but it is an area that comprises 1/3rd of the state. I have had the opportunity to photograph it several times and each time I know I will return. I encourage everyone to visit this place at least once if for nothing else, to hear prairie grass speak with every breath of the wind, to watch the clouds slowly traverse the azure sky and to experience the quiet solitude with only your thoughts as company. Canon 5D Mark II, 70-200 f/4l @ 200mm, f/8, 1/2000 sec. 4 Responses to "Sandhills Sentinel"
Great image, Derrald – rich, but subtle. Really beautiful! Jack, thank you and if you get a chance, visit the sandhills sometime. There are some great photographic opportunities there! This shot is absolutely stunning. The beauty of these lands is amazing.